Gary Kilgore North is an American economic historian. Writing from a Christian Reconstructionist perspective, North has authored or coauthored over fifty books on topics including Christian theology, economics, and history. He is an Associated Scholar of the Ludwig von Mises Institute. In addition, North offers the Ron Paul Curriculum, a home school online curriculum associated with former U.S. Congressman Ron Paul, which is free for grades K-5 and available to paid members from grades 6–12. 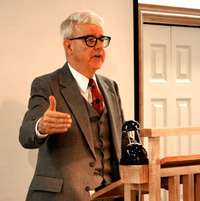 As Director of Curriculum Development, North has outlined four goals of the educational project: providing a "detailed study" of the "history of liberty"; teaching a "thorough understanding of Austrian economics"; serving as a "an academically rigorous c Gary Kilgore North is an American economic historian. Writing from a Christian Reconstructionist perspective, North has authored or coauthored over fifty books on topics including Christian theology, economics, and history. He is an Associated Scholar of the Ludwig von Mises Institute.